William Bascom Wetherall saved numerous blue books from his college days at the University of Idaho. He also saved the following papers he submitted in various law courses. The texts shown here were created from optical character reader scans of image scans of the original reports. The OCR texts were vetted for scanning errors. [sic] and boxed comments are mine (William O. Wetherall). This paper, undated, consists of 4 unnumbered double-spaced typescript pages. The title appears on the top of the 1st page. A few corrections have been made in pencil or black ink. The author's name appears at the end as "Bill Wetherall". The latest date in the paper is June 1934, and the paper is presumed to have been written in the fall or winter of that year, if not in 1935. 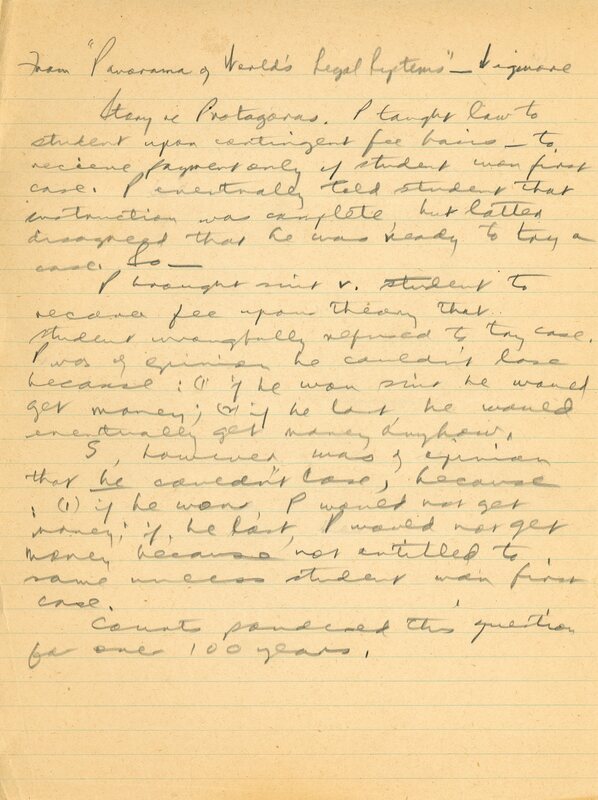 The following transcription reflects all edits that the author himself made in the transcript, either by overstriking when typing the paper, or afterward by hand. The underscoring is as received in the typescript. The (parenthetic remarks) are as received but the [bracketed remarks] are mine. The comments and note on the primary inspiration and source of the paper, following the transcription, are also mine. HISTORY. The declaratory Judgment in a limited form has been known to the common law, or under statute, for many years. The equitable actions for the removal of clouds from title, for impressing trusts on legal title, for nullifying written instruments, for the construction of wills, etc., are all cases in which declaratory judgments have been rendered under other names. Borchard traces the origin of the declaratory judgment back to Roman times. Such a judgment was authorized as a general procedural device in England in Chancery cases in 1852, and was extended to all actions and proceedings in 1883. There were no statutes in the United States until 1919, but since that time declaratory judgment acts have been adopted by 34 states and by the federal government (June, 1934). Some 1,200 cases have arisen under these statutes, affording a solid foundation of case law. Approximately two-thirds of the cases in the English Chancery Reports are initiated by originating summons for a declaratory judgment. NATURE AND PURPOSE. The declaratory judgment differs in no essential respect from any other action, except that the prayer for relief does not seek execution or performance. Its purpose is to provide a speedy, inexpensive, simplified way of settling disputes before they have reached an advanced stage. By means of the declaratory judgment any person may procure from a court of record having proper jurisdiction a declaration of rights, statue, or other legal relations, without breach of contract, and regardless of whether or not any further relief is, or could be, obtained. Such a judgment is conclusive as to the rights of the parties, and is res adjudicata. The basic theory seems to be that a person's rights may be jeopardized not only by an actual invasion, but also by any threatened invasion. The purpose of the declaratory judgment is thus preventative rather than curative. SCOPE. The conditions of the usual action must always be present; namely, the jurisdiction of the court over the parties and subject matter, the capacity of the parties to sue and be sued, the existence of facts justifying the judicial declaration of legal rights, and a sufficient legal interest in the plaintiff to entitle him to a judgment. The oases may be divided into two broad classes: (1) those which might also have justified a coercive judgment or decree, and (2) those for which no other relief is available. As an example of the alternative type of case, plaintiff, instead of bringing suit for the construction of a deed, might have sued for an injunction, specific performance, or damages. (For additional examples, see Borchard, pages 151-153). It is the second, or exclusive, class of cases which causes the most difficulty. The distinctive feature of this group is that no "injury" or "wrong" need have been actually committed or threatened in order to enable plaintiff to bring an action for a declaration of rights; he need only show that some legal interest or right of his has been jeopardized by defendant's assertion of a conflicting claim. For example, plaintiff seeks to establish that he is under no duty to perform a contract for a future period, whereas difendant [sic = defendant] maintains that plaintiff is bound; or, plaintiff may ask the court to declare that she is defendant's wife, altho [although] defendant denies the fact. (For further examples, see Bourhard [sic = Borchard], page 24-25). It is necessary, however, that the controversy be real, not hypothetical; that plaintiff have some legal interest which is capable of being affected by the decision; and that this interest is endangered by an adverse claim. CONSTITUTlONALITY. For some time the courts were doubtful as to whether or not a declaratory judgment was merely a form of an advisory opinion, therefore unconstitutional. The courts of 20 states, however, have decided unanimously in favor of constitutionality, emphasising the fact that a declaratory judgment is in no sense an advisory opinion. The federal act expressly provides for a declaratory adjudication only "in cases of actual controversy". SUPPLEMENTARY RELIEF. Further relief based on a declaratory judgment may be granted, whenever necessary or proper, upon application by petition to any court having jurisdiction to grant the relief. If the application is deemed sufficient, the court shall, on reasonable notice, require any adverse party to show cause why further relief should not be granted. (See Uniform Declaratory Judgments Act, sec. 8). On the other hand, the court may refuse to render a declaratory judgment or decree where it appears that such judgment or decree, if rendered, will rot terminate the uncertainty or controversy giving rise to the proceeding. (See Uniform Act, sec. 6). SUCCESS OF THE DECLARATORY JUDGMENT. As to the value of the declaratory judgment, Sunderland (Prof. of Law, Univ. of Mich.) says, "There is probably no parallel in American legal history to the sudden success of this measure for enlarging the usefullness of the courts." IDAHO LAW. Idaho adopted the Uniform Declaratory Judgments Act in 1933. (See Session Laws,, 1933, chap. 70). State ex rel. Miller, Atty. Gen., v. State Board of Education, 52 P.(2d) 141. (Infirmary case). Distinguish between Uniform Declaratory Judgments Act and I.C.A. Title 7, chap. 10, entitled "Submitting Controversy Without Action". "Declaratory judgments" was perhaps the hottest topic of the time, one that no law student could ignore. The paper is "sophomoric" in that it appears to have been written as part of a course assignment and was written in a very conventional report style. The typescript shows a number of corrections made by overstriking, and a number of other corrections have been made by hand, most in pencil, a few with a fountain pen. Of interest is my father's difficulty with the name of his primary source, Borchard. He initially spelled all four instances "Bouchard". When editing with a pencil, he corrected the first two instances to "Borchard" (changing the "u" to "r"), but miscorrected the second two instances to "Bourhard" (changing the "c" to "r"). Of interest also is his use of "altho" rather than "although" in an otherwise formal paper. Edwin Montefiore Borchard (1884-1951) was an international legal scholar at Yale Law School. He is best remembered for pioneering the adoption by the federal government and the states of so-called "declaratory judgments". 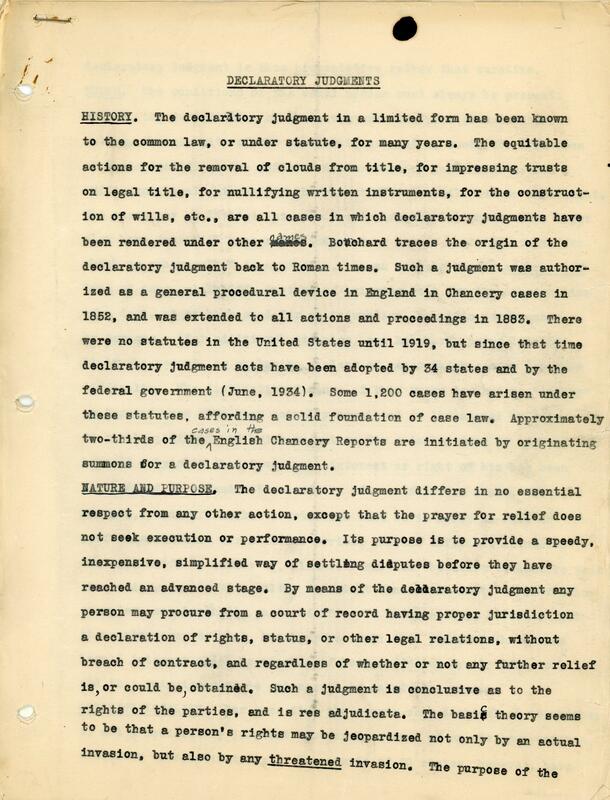 The 1st edition of Borchard's Declaratory Judgments went to press as the Federal Declaratory Judgments Act was being signed into law by Franklin Delanor Roosevelt on 14 June 1934, which gave Federal Courts the power to render such judgements. See also Edwin Borchard, "The Federal Declaratory Judgements Act", 21 Virginia Law Review 35 (1934), Faculty Scholarship Series, 3645 (Yale Law School Legal Scholarship Repository). In a series of articles and studies, beginning with "Declaratory Judgments" in 1918 and ending with The Declaratory Judgment in 1934, Borchard persuasively argued for the utilization of declaratory judgments in state and federal courts. Essentially, a declaratory judgment is a declaration by a court of the rights, duties, or legal status of any interested party to a case before that court; it may or may not be accompanied by a grant of further relief by the court, e.g., an injunction, damages, etc. The device has its roots in the law of the Middle Ages and by the end of the nineteenth century was frequently used in the court systems of Western and Central Europe. Borchard's campaign for the use of this device in American courts resulted in its widespread acceptance in state court systems by the early 1930s. In 1934 the Seventy-Third Congress passed the Federal Declaratory Judgment Act, co-drafted by Borchard, allowing the use of the device in federal courts. In the opinion of Charles E. Clark, Borchard's campaign for the acceptance of the declaratory judgment was ". . . the greatest one-man job of legal reform to occur in this country." The paper consists of 28 unnumbered pages including title page. The title appears only on the title page, and the body of the text is mostly citations, in single-spaced typescript, from statutes and rulings. There are no end notes. A few bibliographic particulars have been noted in blue ink. Limitation of Future Estates.-- A future estate may be limited by the act of the party to commence in possession of a future day, either without the intervention of a precedent estate, or on the termination by lapse of time or otherwise, of a precedent estate created at the same time. The paper consists of 1 title page and 11 numbered pages of double-spaced typescript. The page numbers, and the end-note numbers in the body of the paper, are written in red ink. Some few corrections have been made in blue ink. The paper consists of 1 title page and 22 numbered pages of double-spaced typescript. The page numbers, and the end-note numbers in the body of the paper, are written in red ink. Some corrections have been made in pencil, and there are a few notations, mostly case numbers, in blue ink. 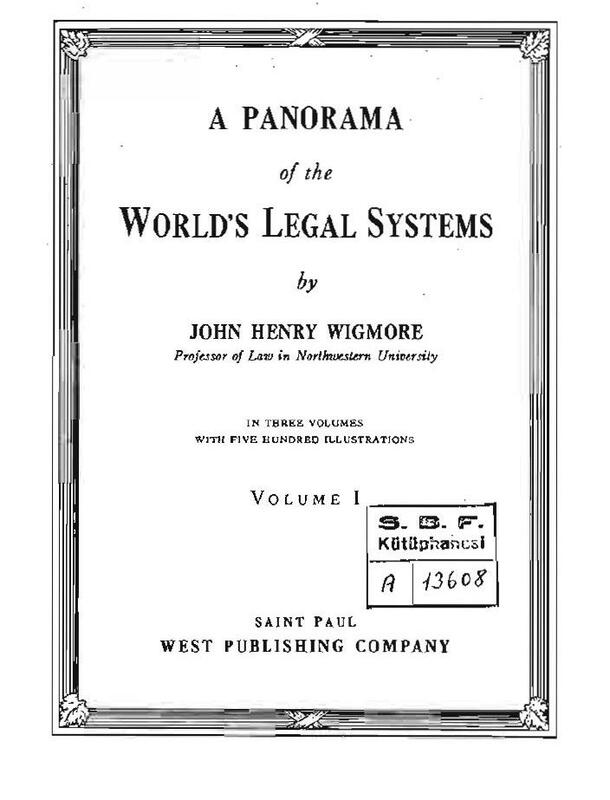 From Wigmore's "Panorama of World's Legal Systems"
One of the more interesting items among my father's papers was a single sheet of ruled tablet paper on which, in pencil, he had paraphrased a well-known conundrum in the history of law and logic. I imagine him and his classmates wrestling with the possible arguments into the wee hours of the night, possibly fueled by beer. P brought suit v. student to recover fee upon theory that student wrongfully refused to try case. P was of opinion that he couldn't lose because: (1) if he won case he would get money; (2) if he lost he would eventually get money anyhow. S, however, was of opinion that he couldn't lose, because: (1) if he won, P would not get money because not entitled to same unless student won first case. Courts pondered this question for over 100 years. My father probably read the story of Protagoras in the following edition of Wigmore's then very well-known book. The above edition was reissued in 1936 by Washington Law Book Company in Washington, DC. The book remained very popular, and remained in print for many years. It is, in fact, a very interesting work. Volume 2 begins with a look at law in Japan from the earliest times. The story as told by Wigmore (see image to right) reads as follows (Wigmore 1928, Volume 1, page 323). It was on the Areopagus that Paul the Apostle made his memorable address to the people of Athens, "O men of Athens, God has made of one blood all nations that dwell upon the earth". And it was before the Court of the Areopagus that the celebrated lawsuit is said to have been brought, related in the anecdote of the contingent fee of Protagoras, the teacher of oratory. He made a contract with his pupil Evalthus that his fee should be payable when the young man won his first lawsuit. After a while the lessons ceased and the teacher pronounced him competent, but the young man insisted that he was not. So the teacher sued. While waiting for trial, the teacher said to his friends: "I win, either way; for if the judgment is for me, he must pay; but if it is for him, he has won his first suit and under the contract he must therefore pay." But the young man said to his friends, "I win, either way; for if the judgment is for me, I am not liable; and if the judgment is against me, I have not yet won my first suit." The judges, it is said, were so puzzled by this logical dilemma, that they adjourned the case for a hundred years. Paul the Apostle's sermon before the people of Athens is related in Acts 17:16-34 in the New Testament of the Bible. The remark about all nations being made of "one blood" is from Acts 17:26. Wigmore related the story better than my father. My father, in paraphrasing Wigmore, resorted to legalese that Wigmore would probably have viewed as pretentious when telling a story, though expected of a student. A good legalist with a sense of style will eschew legalese when not required, knowing that legalese, unless intended as humor, is the best way to kill a story. As a law student, however, my father was probably heady with the language of law, and was bent on using it every opportunity he got. Perhaps he even proposed to my mother in legalese. I recall doing the same thing when going to college. Some of my student papers reek of fashionable "scholarese" -- a habit I struggled to break when relearning to write as a journalist and novelist. There are many versions of this story. Wikipedia presents another in the following article, titled Paradox of the Court, parts of which I have slightly reformated. The Paradox of the Court, also known as the counterdilemma of Euathlus, is a very old problem in logic stemming from ancient Greece. 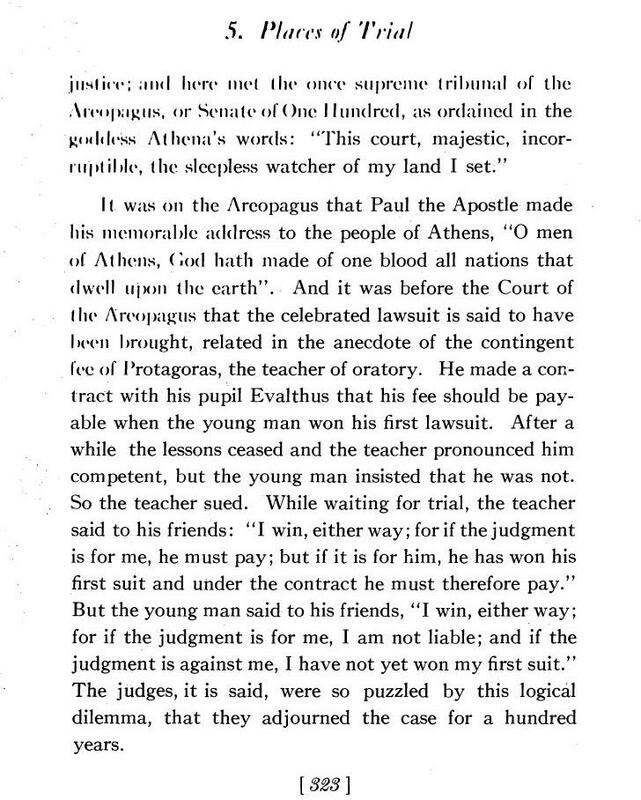 It is said that the famous sophist Protagoras took on a pupil, Euathlus, on the understanding that the student pay Protagoras for his instruction after he wins his first court case. After instruction, Euathlus decided to not enter the profession of law, and Protagoras decided to sue Euathlus for the amount owed. Euathlus, however, claimed that if he won, then by the court's decision he would not have to pay Protagoras. If, on the other hand, Protagoras won, then Euathlus would still not have won a case and would therefore not be obliged to pay. The question is: which of the two men is in the right? From a moral standpoint it may be that either party was right, or that both were not right, due to the ambiguous nature of the scenario. However, as a matter of law, if the Court were to rule in favor of Protagoras, the conditions of the original contract between him and his pupil would be invalid and Euathlus would have to pay Protagoras. If, on the other hand, Euathlus were to win, the Court could also void Euathlus's obligation of payment. However, from an objective standpoint, the way the Court could make its ruling is not necessarily a paradox either. The Court would either rule that Euathlus (as the defendant) had violated the terms of the contract, or had not. The subsequent conundrum would have no legal bearing on the court's decision. Additionally, but contrary to the law of Ancient Athens where defendants were obligated to represent themselves in court, [Note 2] Euathlus could hire a lawyer to take on the case, thus invalidating this case as a standard for payment. Legal counsel in the form of a logographos [Note 3] was only permitted outside the courtroom for both defendants and accusers. 1. Protagoras argues that an unwritten clause of the original contract is that the student must enter into the profession of law. If Protagoras wins this case then Euathlus must pay. If Protagoras loses then Euathlus must pay under the original contract. However, in this event Euathlus may argue . . .
2. An unwritten assumption of the contract is that cases between the two individuals are exempt from the contract. Citing logical rules preventing the application of a condition to itself. Euathlus can only avoid payment if he wins both case 1. and case 2. In some versions Protagoras would demand the money if and only if Euathlus wins his first court case. [Note 4] Some accounts claim that Protagoras demanded his money as soon as Euathlus completed his, others say that Protagoras waited until it was obvious that Euathlus was making no effort to take on clients [Note 5] and still others [Note 6] assert that Euathlus made a genuine attempt but that no clients ever came. Aulus Gellius, Attic Nights, book 5, chapter 10. "An Introduction to the Athenian Legal System". www.stoa.org. "A Glossary of Athenian Legal Terms". www.stoa.org. L. Alqvist, "Deontic Logic", in Handbook of Philosophical logic, vol. II, pp. 605-714, 1984. Peter Suber, rotagoras v. Euathlus, a section within The Paradox of Self-Amendment, Peter Lang Publishing, 1990.